The Upper Cascade Falls trail is located in the Uncompahgre National Forest near Ouray, Colorado. 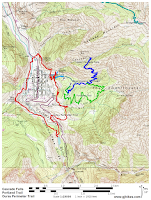 The trail begins at the Amphitheatre Campground on the southeast side of Ouray and climbs a ridge on the northern edge of the Ouray Amphitheatre before making a short descent to the Upper Cascade Falls. The trail leads through patches of oakbrush and tall conifers such as ponderosa pines and massive Engelmann spruce. The trail has almost 2,700 feet of elevation gain with an average grade of 23% which is enough to provide a good workout for the hardiest of hikers and trail runners. To get to the trailhead drive south out of Ouray as though you were headed up Red Mountain Pass. After about a half mile turn left at the sign for the Amphitheatre Recreation Area. Follow the road for about 1 mile to the campground. The trailhead is at the end of the road. The campground is only open seasonally but if the gate is locked there is another trailhead across from the picnic area just before the gate. 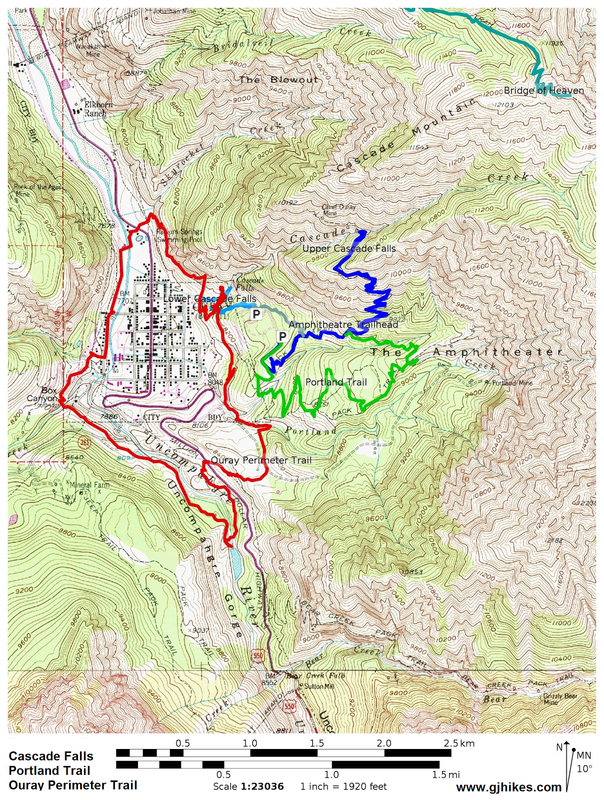 Beginning at the lower trailhead will add about 1.2 miles to the round trip distance. While there isn't a restroom at the trailhead there is one at the picnic area as well as in the campground itself. The trail begins climbing along a moderate slope above the campground. A trail register comes up after a short distance and at the quarter mile point from the trailhead a spur of the Portland trail branches off on the right. The trail continues its moderate climb and just over the half mile point it comes to another junction where it is joined by the connector trail that leads down to to the Amphitheatre Picnic Area. At just under the 1 mile point the Upper Cascade Falls trail is met by the upper end of the Portland trail. Combining the Portland trail with the previous portion of the Upper Cascade Falls trail creates a fun loop to hike. From the last fork the trail gets a little steeper. Other than a couple of short steeper sections of the trail the climb is made easier by making use of a series of switchbacks. The trail levels off a bit as it reaches its highest point where it begins traversing around a bench at the base of a rocky outcrop. The scenic nature of this section of trail and the distant view the high perch provides make the hike all worthwhile even without the coming waterfalls. The views from the ridge are outstanding. This photo is looking out over the Million Dollar Highway at Red Mountain. This shot is looking into Yankee Boy Basin on the other side of Ouray. After rounding the point of the ridge the trail makes a short descent to Cascade Creek and the falls. Cascade Creek begins above 12,000 feet as it drains the snow filled colliers on the west side of Cascade Mountain. If you hike up the Horsethief trail past the Bridge of Heaven you can actually walk across the colliers that feed the creek. The creek plunges down the cliff above the trail then levels off at the point the trail crosses it and then it makes a more dramatic drop down the next cliff which is much more vertical. It is so vertical, in fact, that if you want to see the falls below the trail you have to either lay on your belly and look over the edge or cross the creek and hike 20 or 30 yards to where you can look back to get a glimpse of it. The trail continues a short distance past the falls to the Chief Ouray mine. The trail is very narrow in spots and not for the faint of heart. The building in this photo is the bunkhouse for the mine which is a little further away. Thunderstorms can bubble up at most any time in the mountains. To ensure a pleasant experience it is always good to carry a raincoat and to avoid open space during lightning storms. While we were hiking the trail for this post we encountered a couple of brief moments of rain that quickly gave way to sunnier skies. A popular alternative to retracing the Upper Cascade Falls trail all the way back to the trailhead is to jump off on the Portland trail and hiking it in the downhill direction. If you choose that route be sure to watch for the branch near the bottom that leads to the Amphitheatre Campground. The turnoff comes up about 3 tenths of a mile before the lower Portland trailhead. There is a trail sign at the turn to make it easier to spot. The Upper Cascade Falls trail has some awesome views and sees only a fraction of the crowds that hike the Lower Cascade Falls trail. If you would like to see it for yourself then all you have to do is 'Take a hike'.